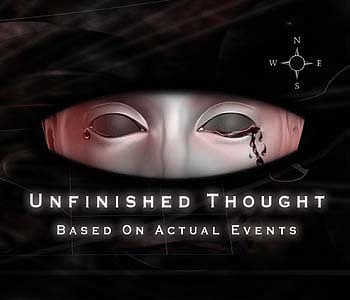 Unfinished Thought certainly ain't a band you can meet everyday, just because it's quite rare to find 2 people dedicating so many efforts to the recording, release and promotion of an album nowadays without losing an ounce of inspiration. I've always been convinced that when you don't have much time to experiment on behalf of label deadline schedules, and when you don't have any chance to risk cos if you fail the label will drop you, then it becomes hugely unlikely to survive and stand out. Add that every developed country produces thousands of rock CDs or vinyls every year, and then you'll get a picture why there were great bands in the 70's and 80's, whereas the resting years onwards just allowed a few good bands but hardly any legends and very few unforgettable songs entered the book of classics. Yet, there are some trying to achieve the status of wonder CD of the year, and Michigan's duo's come back seems to be one of these, and luckily most of all - a memorable record including a handful of compositions pleasant to be played again even in the far future. Just admit it, how many pieces from your CDography were listened to again this year? Not many indeed, and "Based on Actual Events" owing to manifold qualities present at the same time definitely shan't get covered with dust like most of your collection, trust me! 12 tracks narrating a story about the mysterious disappearance of an unforgattable individual, 'the Timid', a recluse about to lose his mental soundness, pushed by an ever-growing depression; a real potential suicide, hoping to be reborn into a memoryless world giving the miserable bloke a second chance. Now, the possibilities are 2: either Stacey has telepathic powers, or she lived similar experiences in her own life like mine, however I feel this character quite autobiographical and that's another point in favor of her. Even if one may have slight different interpretations while reading the lyrics, one sees that the chap's life doesn't end well as one would expect, and that reflects the 2-piece's life vision: hopeless. The kick-off is given by "Through Crowded Rooms" mixing dark-wave, metal, industrial and electronica, with Stacey Nelson's voice, now sweet and magnetic, on other occasions hovering and quavering; to be cited the short funeral keyboards break, but keep in mind that during all the 53 minutes this instrument is never a frill and on the contrary plays an important role in the sound economy, differently from most gothic bands. Based on a lively programming, "Sidewalks" lulls you with Stacey's swinging vocals, pulsating bass lines, making me think of a hybrid between Evanescence and Lacuna Coil, among the others. In the elaborated "By the Time You Read This" Stacey's first vocals are close to Skunk Anansie's, but when the programming starts they change and are layered on male vocals in the background; the sanguiness of rock guitars is fused with the coldness of the programmed drums, the crawling and obsessive keys melt with penetrating riffs, while the vocals do sound dramatical in the refrain, one of my favorites. Another highlight of the CD is "Umbrella", most Dead Can Dance-oriented; this is a masterpiece, nevertheless wholly different from the previous song, where Stacey's voice is angelic and melancholic at the same time, accompanied by only a piano and a light programmed percussion (or maybe just a synth). I wouldn't be surprised at all if the video matched with this song would make a go of it, as U.T. proved they pay attention to every single aspect of their project, and that's a rewarding policy 90 times outa 100. The clip was professionally shot with a steadycam in particularly suggestive places, especially a big wood during fall. Easy and effective as shown in the DVD making-of. The follower's called "Probabilities" and borrows a helluva hard beats dear to Nine Inch Nails, while the vocals are as shining as the bass notes; danceable but not commercial tout-court; Stacey used dubbed vocals here, and reminds me of Lacuna Coil's Cristina Scabbia's. The programming proves to be heavy, while the 6-string sounds are strongly modern metal. "Evening" touches quality pop-rock shores, with the black-haired goddess seducing me with her catty hooks; the chorus and the riffing are real mind-penetrating, so that I feel like a mouse in the clutches of the unmerciful Pied Piperess from Kalamazoo. The recording and the mixing would be excellent even for an unselfreleased act, tho I'm sure they're not enough to justify the siren's effect such a song has on me. Hypnotic is the drumming at the beginning of "Don't Stop Raindrop", using very 80's keyboards sounds, and alternating it with electrically nervous structures; multi-instrumentalist and co-leader Joe Kiser turns this song from an ordinary one to an efficient one thanks to some Goblin-like keyboards notes suitable for an auteur horror flick. Simply wonderful the words of "The Order of Detail", the Gathering-influenced vocals and the piano notes, bringing to a climax, making me think of the lightest Evanescence, and then to a dynamical break; before the initial strophe is re-used, the song remains close to gothic metal coordinates. Unfinished Thought own several potential singles to choose from this record, and "Perfectly Still" belongs to that group. If you liked "Mandylion", you'll drool for this song, although I must admit there's more, like the odd parts with overdubbed vocal parts (all female like in all the CD), far from the Dutch act's standards. An arpeggio opens "The Timid", the longest track of all, slightly employing Pink Floydian guitars and mellow keyboards; it seems to me this is the only track with a human drummer, but the point is that this is the most complete composition of U.T., representing almost all their shades; it's a soft song, yet not banal at all. I'm convinced that even tho you're knocking on 20, you'll dig this kinda songwriting, notwithstanding it's straightforward and not aggressive. Fervent is the right adjective to qualify "Silhouette", gifted with its winding drum 'n' bass moves a là NIN, or trip hop a là Portishead; once again Stacey doesn't miss a nanosecond in her beats, and besides the song's effect is doubled if you listen to that with a serious subwoofer. Thrills and hearts broken the results for the closer, "Coming Back"; you can really feel the sadness of the piano and the passional hopelessness sung here, and sustained by deep lyrics; there're also some violin lines - probably synthetized - to reinforce this atmosphere before a ringing phone, the name Lucy repeated with obsession and another unidentified noise. A very disturbing end for a masterpiece of decay started not happily, and alike "Umbrella", based on the piano and Stacey's voice but without the programming. Joe and Stacey have passed every test: to me, they're all-round pro musicians; not only performers, but also remarkable songwriters in an utterly creative period of their careers. It really is true that after Evanescence's success, who even played some U.T. 's songs live, this genre has become extremely profitable in Uncle Sam's land. But still their artistic side is decidedly larger than the business one as yet. Listening to the duo is an experience that will make your hearts emotion, bleed, freeze and finally wither and implode into themselves. What makes my day is their perfectionism, absolutely needed for a music like this, in which moral decadence and despondency are the very goals. When you love music, people notice that. Now I can only hope to see them live in Italy as a 6-piece due to the obvious recourse to session musicians. Buy or feel responsible if mainstream keeps on force-feeding you with soulless mersh.